The Belgian Grand Prix driver ratings are in. Who impressed on the first race back following the summer break? Sebastian Vettel:We were getting into ‘must-win’ territory for Sebastian Vettel and Ferrari if their title ambitions are to be realised this year and the four-time World Champion duly obliged by seizing his opportunity to overtake his title rival Lewis Hamilton at the end of the long Kemmel Straight just before the Safety Car was deployed. The rain proved problematic for Vettel once again during qualifying on Saturday, but the heavens thankfully didn’t open on him on this occasion and he recorded a pretty straightforward fifth victory of the season to narrow Hamilton’s gap at the top to 17 points. Vettel repelled one serious attack from Hamilton after the Safety Car disappeared and just about covered off an attempted undercut from the Brit who tore a big chunk out of his race lead. Lewis Hamilton: The World Championship leader was very wary of the threat posed by Vettel and Ferrari on race day in Spa – and those fears were quickly realised. Hamilton was once again masterful in the wet to clinch a record fifth pole position in Belgium, but he was simply powerless as Vettel picked his spot at the end of the long Kemmel Straight on the first lap to take the race lead. “He went past me like I wasn’t even there,” he bemoaned. The Safety Car did provide Hamilton with a glimmer of hope of overtaking Vettel again once it peeled away, but there is a nagging feeling that he picked the wrong spot to launch his attack at the Bus Stop chicane as opposed to the Kemmel Straight. The gap was too big by the time the two four-time World Champions reached there and then the Mercedes pit wall could only give him one more small opportunity with an attempted undercut midway through the race which didn’t pay off. Max Verstappen:After never finishing higher than P8 in three starts at Spa and never completing a lap in the top four, there was finally some good news for Max and his huge army of support in Belgium as he bagged his first podium finish in four races. With Raikkonen and Ricciardo quickly out of the equation, Verstappen had his sights firmly set on the likes of Grosjean, Perez and Ocon in front him. His stunning dummy overtake on Ocon at Le Combes was the absolute pick of the bunch and a move that team-mate and overtaking extraordinaire Ricciardo would have been very proud of himself. Valtteri Bottas: Taking on a brand new Spec-3 engine at Spa meant that Bottas could not play as much as a wingman role from a starting spot of P17 on the grid. The Finn was soon back into the points, as you would expect in his superior Mercedes, and set about climbing all the way to P4 with the podium a little too out of sight from his lowly grid position. There was a lovely move on Hartley through Raidillon before a late pit stop on the soft tyres left him needing to overtake two Force India cars with 14 laps to spare. The strategy was perfectly timed as he waltzed past both with ease and collected some valuable points in the wake of Raikkonen’s DNF for Ferrari. Sergio Perez: The Mexican said he “sh*t his pants” after almost crashing out in wet conditions through Raidillion during qualifying and it is just as well he rescued the situation as he went onto the equal his career-best qualy with a P4 start. In the race, with some clean underwear we hope, he was always going to be vulnerable to the likes of Verstappen and Bottas behind, but he grabbed his opportunity to steal a place from Ocon, who found himself in the unfamiliar scenario of challenging for the race lead on the opening lap. Perez was able to stay out in front of his team-mate, who would help ensure that the two Haas cars would not pose any real threat to the newly-formed Racing Point Force India. Esteban Ocon: “You can’t let someone who has more money leap in front of a better driver,” said a sympathetic Lewis Hamilton about Esteban Ocon as he faces an extremely uncertain future. But that is the harsh reality in Formula 1: money talks. The talented Frenchman secured an incredible P3 in qualifying to match his exploits in Monza last year, which was also achieved in wet conditions. 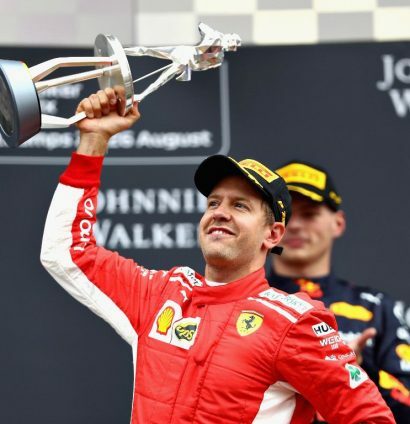 He then had a crack at Vettel and Hamilton for the race lead just for good measure in what was an incredible start to the Belgian Grand Prix. He lost out to Perez in the process but who can blame him for having a go? Romain Grosjean:This was another very strong showing from Grosjean who has got the message loud and clear that his Haas and Formula 1 future are on the line. Force India stole the headlines in qualifying by locking down the front row but the Frenchman deserves credit too for landing a P5 start. Grosjean envisaged a battle with Force India up ahead and, although that did not materialise, he produced a solid drive to keep ahead of his team-mate and collect his fourth points finish in his last five races. Marcus Ericsson:Ericsson thinks Sauber are capable of scoring points in every race between now and the end of the season and he played his part in keeping the prediction alive with team-mate Leclerc suffering yet another unlucky DNF. It was quite an eventful race for the Swede as he tussled with the Williams of Sirotkin in the opening stages before trading blows with Hartley on several occasions through Eau Rouge, Raidillon and the Kemmel Straight. Carlos Sainz: In his first race since being announced as Fernando Alonso’s replacement, it seems some of the McLaren curse is already beginning to rub off on him. No rear grip in qualifying saw him exit Q1 for a second time this season and then confirmation of engine penalties on Sunday morning took him down three places to P19 on the starting grid. Brendon Hartley:The New Zealander has been given assurances that he will stay at Toro Rosso next season if he performs to a decent standard and collects more points along the way between now and Abu Dhabi. 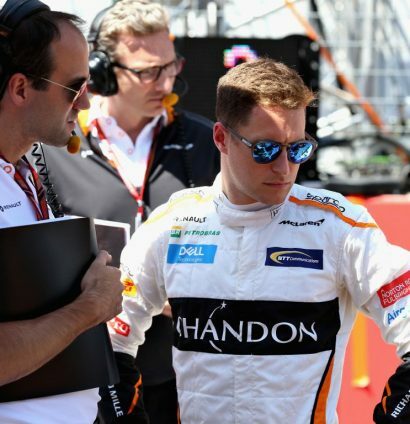 Stoffel Vandoorne: Returning from the summer break at his home grand prix was supposed to represent a fresh, positive start for the under-pressure Belgian after being on course for a points finish in the previous race in Hungary – but it was a horror weekend pretty much as soon as he hit the track. His car continues to cause him all sorts of problems with brake and hydraulic issues ensuring he was slowest in all three practice sessions before notching up another unwanted P20 in qualifying. Penalties to Bottas and Hulkenberg were set to boost him up the order a little, but a late decision to change the entire power unit put him right back in last again. He tried to get some momentum going by switching up his strategy by pitting under the Safety Car, but he would go on to complete a rather depressing full house by being last of the 15 finishers. Daniel Ricciardo: The Aussie must be counting down the races before he can press the reset button at the end of the season. It has been pretty grim since Monaco and Spa only added to the misery. Both he and Verstappen were under-fuelled for qualifying, limiting him to P8, while his race was also effectively over at the first corner. He picked up rear-wing damage after being tagged at the start and then punctured Raikkonen’s right rear with his front left in the aftermath. 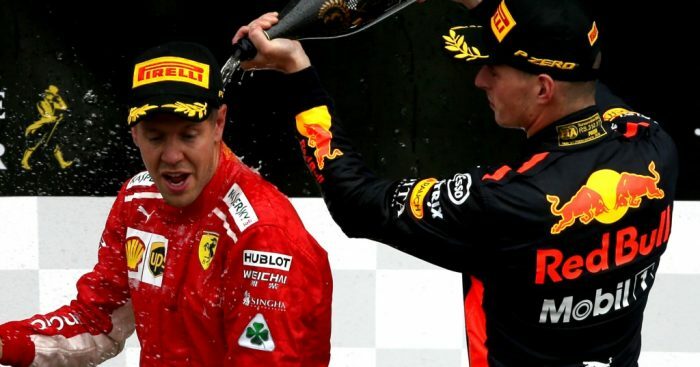 Kimi Raikkonen:Raikkonen was seeking a sixth consecutive podium finish and the 100th of his career this weekend but the Finn can consider himself incredibly hard done by at Spa. A fuelling miscalculation on Ferrari’s part took Raikkonen firmly out of contention for pole position after showing good pace prior to qualifying and his race was over by lap nine after picking up terminal damage in a collision involving Ricciardo. Fernando Alonso: It’s never quiet when Fernando Alonso is around, is it? 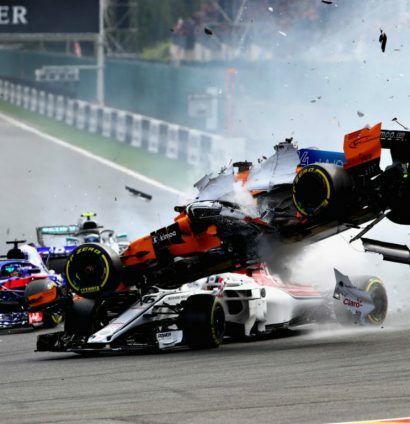 A slanging match with Red Bull followed by a huge crash at the start of the Belgian Grand Prix after being sent flying into the air by Nico Hulkenberg. His car was in absolute shreds, but thankfully he walked away unscathed.